I’m working on the detail for a project near Cardiff at the moment and we’re looking at different wall cladding which will enhance the garden and help to zone each area. As part of the project we’ll be removing the existing bank and replacing the boundary fence with a wall which will make the garden usable and inviting and also much bigger. 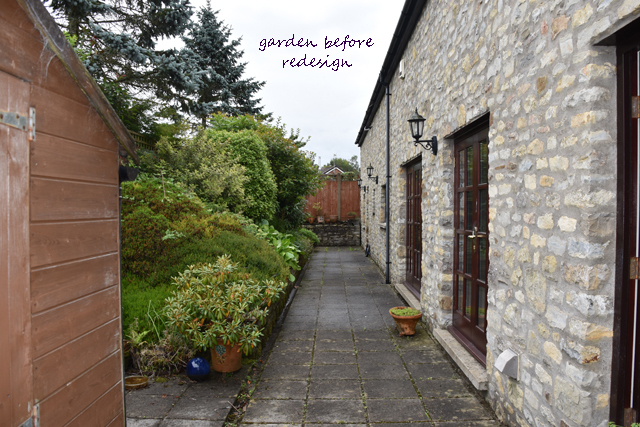 As the barn conversion is built with the original stone, I’d like to bring some stonework into the equation, but I think to face the whole boundary wall will make it feel too enclosed and overpowering so I want to bring in some light, more elegant materials which will reflect more light and make the whole garden more welcoming. It’s a north-facing garden so gets very little sun throughout the day. Choosing the right materials is therefore really important. A painted rendered wall, for example, will essentially be a maintenance nightmare as it’s likely to need repainting every year. One option I’ve been exploring is a material called DesignClad, a relatively new 5mm thick porcelain cladding from London Stone. It’s virtually non-porous and highly scratch resistant, available in large sheets and various finishes. 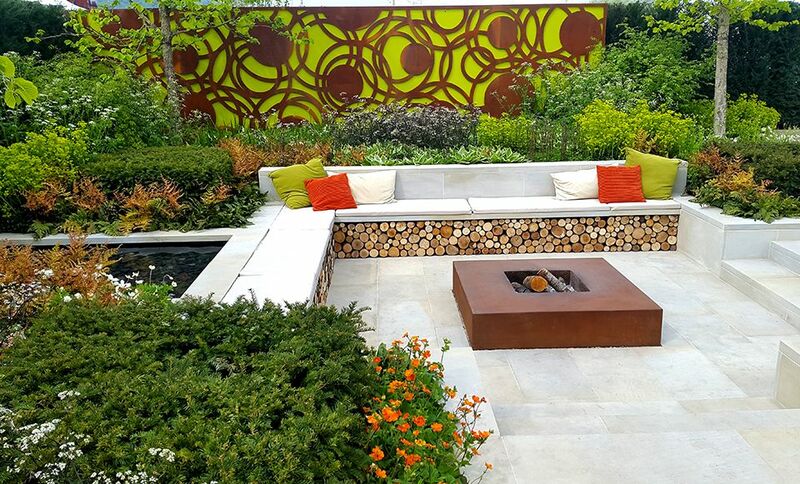 My favourite is the corten steel finish (as above), but a lighter colour may work best in a dark garden. As it’s porcelain it will be really easy to wipe clean and it can be fixed to a basic concrete block wall with exterior tile grout. This garden will also have a water rill so if we do use this for part of the wall it might be nice to clad the inside of the rill with the same material. Another option is to use composite decking. I love natural timber but, again, in a shady garden it comes back to maintenance and how easy it is to keep the garden looking top notch with the minimum amount of effort. We’re likely to use some composite decking within the paved areas so it might make sense to use some on the wall too. The material of choice I think will be Millboard. It’s at the higher end of the composite decking market, but it looks classy. The image above shows the weathered oak range in an embered finish. This will probably be too dark but there is a lighter colour that I’m thinking might work. The weathered oak range has a rustic feel to it, but the enhanced grain decking would also work really well, especially in a more contemporary space. Another thought is to perhaps highlight a section of wall using a decorative aluminium or corten steel panel. Grace & Webb do an amazing range of different patterns and finishes, including a copper colour which I love. The image above shows Laser cut corten wall feature by Grace & Webb for The Graduate Gardener’s Malvern Spring Show, designed by Ann Walker. This is obviously a bold pattern, but it completely lifts the garden, especially with the lime green wall behind it. The aluminium panels can be powder coated in any RAL colour. It’s also possible to design your own pattern for something truly unique. I’ve only covered three options here, but there are plenty more things to consider. Stone wall cladding I don’t think will work because it will fight with the natural stone walls on the house. Any stone work in the garden needs to tie in with that. Essentially we need to choose something that lifts the whole design and enhances the space. I’m meeting my clients on Monday with lots of samples so looking forward to making our choices then.